A couple years ago when someone first told me about WAP (Weston A. Price), I joined an online group. People there kept talking about kombucha. It sounded weird! I had no idea what it was, or why anyone would want to drink it. They kept talking about it as this special, prized drink that they wanted their children to have, and debating its merits. It wasn’t until almost a year ago (quite awhile after I first heard of it!) that I really tried it — and liked it. Today I brew about 6 gallons of the stuff every two weeks. Yes, we go through that much, and could honestly go through a lot more, if I had the jars to do it. But what is it? And why do you want to drink it? Kombucha is actually a traditional, femented Chinese tea. Its exact origins are actually unknown, although there are various theories on where it came from and how. There’s one story about how a man was really trying to make a type of vinegar, but some sort of “contamination” got in, and it grew this tough, beige-colored “mushroom” on top. But he loved the resulting drink so much that he continued to brew it, and spread it around. Today, kombucha has regained popularity among many, including celebrities (there was a bit of a scandal last summer involving Lindsey Lohan, who apparently drinks it and loves it, which resulted in several commercial brands being pulled from store shelves temporarily). It is a dairy-free probiotic drink. It has a sweet-and-sour taste to it, owing to the fact that it is slightly “vinegar-ish.” It is reputed to contain lots of B vitamins and enzymes; and be able to cleanse the liver; repopulate the gut with good bacteria; improve skin, hair, and nails; improve digestion; and much more. In our personal experience, we feel much better when we drink it on a regular basis. It’s usually naturally carbonated, so it makes a great low-sugar replacement for soda. It’s a great method of hydration too. It does take some getting used to for some (others like it immediately), and homemade is very different from store-bought. Home brewers can adjust the taste to their liking in a variety of different ways. As I said…we’ve been brewing for about a year and we love it! Except my daughter…she doesn’t like anything that has bubbles in it. My son, however, loves it! There is a small question about whether or not kombucha contains alcohol, since it is a fermented product (and many go through a second ferment with some fruit juice that’s done in sealed jars, when it can produce some alcohol), but most estimates put the potential alcohol level at less than 0.5%. We don’t drink, but I have no qualms about consuming kombucha, even in large quantities (I’ve had up to 40 oz. in a day before) or giving it to my small children. You may feel as if you are drinking alcohol when you first consume it (warm, happy, buzz-type feeling; but this is caused by the probiotics and enzymes, not alcohol), but every source I’ve found says it is not an alcoholic beverage. Please be aware this is a small concern with almost any type of fermented food (not just kombucha), since the fermentation does naturally produce a very small amount of alcohol. Trace amounts only. While there are several brands at the store to choose from (my favorite happens to be G.T. Dave’s, the largest), it’s expensive. A 16-oz. bottle typically runs around $4. Obviously if each person in your home is drinking at least 1 bottle a day, that can add up fast. Who can afford it?! However, home brewing is very cheap. A gallon costs me around $0.30 (for plain) or $0.95 (for grape, our favorite). Even with a flavor we’re still talking 7 16-oz. bottles for less than $1! That’s a week’s worth for each person — completely affordable. Even on my newly restricted budget! 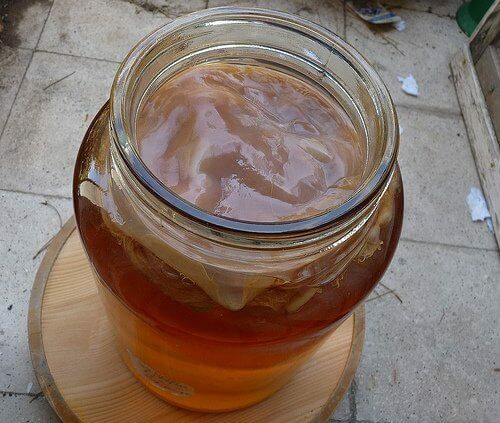 **Stephanie’s note: Several of you have asked me where you can get a SCOBY to begin making your own kombucha. One fantastic place that I know of to buy kombucha starter (and many other starter cultures) is Cultures for Health. They sell the starter for $12 and a starter kit for only $16. Another option is craigslist. You can often find someone local to you who is willing to give away or sell their extra SCOBYs. As well, I’ve also heard that you can make your own SCOBY (though I haven’t tried that myself yet). A reader left this link to a tutorial on how to do so. Okay, this is easy! I’ll outline the procedure very basically here, but you can click through to see a photo tutorial here. Boil some of the water. Add the tea bags and steep five minutes; remove. Stir the sugar into the hot water. Pour the strong tea into the gallon-sized glass jar and add the rest of the water, filling not quite to the top. Cover with a towel or other “breathable” item and secure with a rubberband. Keeps the flies out, lets air in. Let it sit for 5 – 16 days (average is 7 – 9), then bottle. If using flavor, add about 2 oz. (1/4 c.) per quart of kombucha, and let it sit 2 – 3 days longer. Place finished kombucha in the fridge; enjoy when chilled! I should note — when we first started brewing, we tried 11 days (this was still in the winter/early spring, so it was cold and dry) and it was too long. 7 or 8 was just about right. In the summer as we got better at brewing and more used to the kombucha, we brewed usually 11 – 12 days, with an additional 2 days on the counter (bottled). This winter, we needed 16 – 18 days initially and 4 in the second ferment! It varies entirely depending on the container you use (a larger surface area brews faster and is more carbonated than a tall, skinny jar with less surface area), the temperature and humidity levels, and even the age of your SCOBY. Don’t let that scare you, though. Your first few batches will be drinkable but not perfect, and you’ll learn how you like it as you go along! If you’re new to this, check out the Kombucha FAQ and Kombucha Brewing Tips and Hints to learn even more about it! Do you drink kombucha? What’s your favorite way? I just started drinking it the past few weeks. Still trying to adjust to the taste. I would love to know how you make the grape kombucha. I made fermented lemonaid before, so would you just add the fruit of your choice during fermentation? @Chris, After the initial ferment, bottle it and add a small amount of fruit or juice, then seal and leave it 2 – 3 more days (4 – 5 if it’s really cool in your house). There are all kinds of neat flavors! Thanks! One more question, I buy my kombucha from a farm, and have already put it in the fridge, is it too late to take out and add some chunks of fruit? I have my first batch going right now! I’m starting slow with a bottle of GT and growing my own scoby. Two questions, first, what do you do with the scoby when you bottle up a finished batch? And also, how do you make grape flavored kombucha? @katie, You’ll have two SCOBYs, so you can start two batches if you want, or you can dispose of the extra one (give it to a friend, compost it, throw it out). I’ve been dumping my extras in my garden! For grape, just add about 1 oz. of grape juice to 15 oz. of kombucha (or 2 oz. to 30 oz. for a quart jar). Seal it, and let it sit on the counter for 2 – 3 more days, then put in the fridge. It should be nice and fizzy and grape-flavored then! You can do this with any type of juice or flavoring. We’ve done strawberry and ginger too. Thanks!! I started mine on Sunday and it’s foaming on top! Woohoo! Waiting till the weekend to check it again. It is making my closet smell like a vinegar brewery…house is on the market so i’d better move it somewhere no one will be opening doors. 🙂 china cabinet maybe. The flavoring idea is great, thanks so much! I find it weirdly addictive for something that smells like stinky feet! 🙂 I experimented with making my own but was slightly paranoid about making it wrong, especially after one batch got contaminated. Maybe I need to try again. @Hannah, Contamination is unusual! You should try again. 🙂 Did you have it away from other fermenting foods and covered? I once left a SCOBY in a jar for maybe 4 – 5 months before it actually grew any mold. And by the way, if you see white foamy stuff on the top…that’s not contamination, it’s just a new SCOBY. 🙂 I was confused by that at first and wondered if I’d done something wrong! But no, it’s normal. This sounds really interesting. I was wondering about the cafeine since it uses black tea. Does it dissipate during processing or is it a cafeinated drink? @Amy J., The caffeine is supposedly consumed during fermentation. I’m pretty sensitive to caffeine (like, one cup of coffee bothers me), but I’ve never had a problem with kombucha. My son doesn’t seem bothered either. That was a very informative post. Is there a way to make this without using black/green/white tea leaves? We love herbal tea around here, would that work? @Lindsey, I’ve *heard*, but have not tried, rooibos tea. Do you not like black/green tea? It doesn’t taste like tea at all when finished. If you try another type of tea, let us know! Thanks for the info! I’ve got some rooibos in my pantry, we’ll give it a try with that! 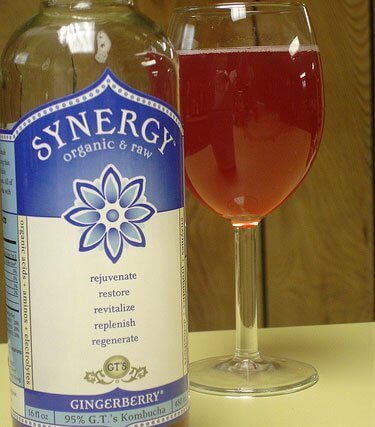 I absolutely love kombucha! I’m drinking some right now! We just started adding juice to it, and my husband really likes it this way. Lately, we’ve found that our kombucha gets really sour really fast, so I’m working to balance that out. For a couple bucks and just a few minutes work each week, it’s a really easy way to boost our health noticeably! @Sarah, how do you keep it from getting sour really fast? I just ordered a start kit from Cultures for Health over the weekend. I’m so excited for it to get here so I can try this out! Oh how I love thee kombucha! My husband and I drink about 16oz. a day each. It helps keep my sugar cravings away, and it cured my husband’s chronic heartburn. If I go a few days without it I get mad cravings for it! Grape is our our classic go-to flavor, but recently I’ve discovered that a tablespoon of lemonade (we use Santa Cruz organic lemonade) and a strawberry sliced up makes an excellent strawberry lemonade flavor. We have to let it sit 5 days during the second ferment to get it fizzy enough but the results are well worth it. Ok my mouth is watering now just thinking about it! Can nursing mothers drink kombucha? I have heard that it is a a natural detoxifier, and I am usually pregnant or nursing, so I would love to hear your take on this. @Christine, I started while nursing…my son was 8 or 9 months old and just barely on solids. It did not bother him. I would go very slowly (just an ounce or two a day) until you know how you and baby will react to it. Then, you can increase as long as you’re both doing fine. We had no problems with it (and generally I’ve had no problems with it in this pregnancy…I couldn’t drink it much in the first trimester, but around 10 weeks I could again) and my son loves it now! @Christine, I started drinking kombucha when I was pregnant, and I just made sure to drink a lot of water so that any toxins would get flushed out the right way instead of making it’s way to the baby or into my breast milk after my daughter was born. It may not be wise to offer/suggest kombucha to someone with a known alcohol problem, particularly if that person identifies themselves as an alcoholic and is seeking recovery. While the alcohol content level of kombucha isn’t anymore than a glass of O.J., the fermentation taste may be a stumbling block. I’d strongly recommend that you fully disclose the nature of kombucha and its taste to another person when recommending it, so that the individual can make a fully informed decision as to whether kombucha is for them. @Anna, I hadn’t thought of this angle. I really am not familiar with alcoholism. I was more addressing the concerns of families (like ours) who choose not to drink for personal or religious reasons. Alcoholics would have to decide on a case-by-case basis, I would think. Some may find it a relief to have a healthy drink that replaces alcohol; some may find it to be a stumbling block that increases cravings. But this is not my area of expertise at all, so I’d definitely encourage anyone with this issue to seek support when making any type of medical decision (including consuming kombucha). I know that is where you were coming from, and I certainly don’t want anyone to disregard the benefits of kombucha. Thank you for acknowledging the concern and supporting individual discretion. How does Kombucha differ or compare to Water Kefir? Thank you! We just finished off my first batch of kombucha. My husband absolutely loved it! I have my second batch going already, but I can see that I am going to have to make a LOT more. My older kids are hesitant to even try it because they saw the scoby, but my little ones tried it. They will drink it, but I think it will take a little while for them to get used to. I’ve been making kombucha for a few months now and love it. I find that I can make it through my stressful workdays much easier with a bottle of home-brewed kombucha on hand. I like to put chopped fruit in mine after brewing to flavor it, since I never buy juice. Not sure if someone already asked this as it was a hasty read tonight. Would there be another way to brew it besides black or green tea, which contains caffeine and is not viable for those with heart problems? @RG, my mom uses naturally decaffeinated green tea for her kombucha. “warm, happy, buzz-type feeling” is caused by the probiotics and enzymes, not alcohol? I would love to understand how that is possible? Why would this not occur with milk kefir or yogurt too? I drank about 8 oz yesterday. I’ve never had that much in a day. In fact, I’ve only drank it a handful of times and only about 2 or 3 oz. Well soon after I drank it, I got a weird headache. Now today it’s worse. Almost unbearable. I wasn’t sure is it normal? Is it going to go away on its own? @Evie, That sounds like a detox reaction. I would start with less since you’re not used to drinking that much, and then you can slowly work your way up to that much. Question: I’m in the breastfeeding/having kids stage of life. Can I not drink Kombucha until I’m through this season of life? My understanding was that it could potentially release toxins into the breastmilk. Do you know anything about this or have any advice? @Shortermama, I drank Kombucha during my pregnancy with my son, a small glass when I would go to my mom’s house, she brewed it. It was the only thing that alleviated my heartburn! And I drank more of it while I was nursing with no ill side affects. My son is two now and healthy and thriving. i made my first batch, it tasted pretty good, but after being in the frig a few days, it tastes a little flat. i did not know to do the second fermenting. is there a way to make it more bubbly now that it is in the frig, or do i just need to make another batch? Great post! We love kombucha in our home. Another resource for finding a SCOBY is Etsy. Can i use a glass jar that has a plastic spigot? I love kombucha! I started drinking it about a year ago, and have noticed a difference in my health – a couple of times I’ve slacked off with my brewing and had to wait 5-7 days for a new batch, and I’ll feel less energetic. I need to start doing a second ferment with fruit juice, maybe that will get my 4 year old son interested – the grape juice option sounds like the way to go! We use Green Tea and LOVE it! I love your site and am so glad I found it on Pinterest.